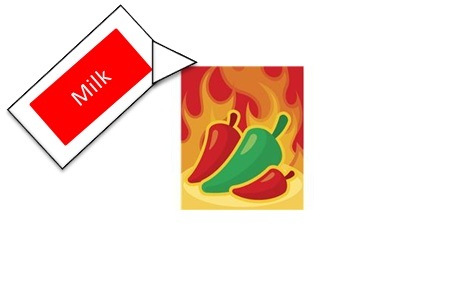 Milk… is it really the cure to the spicy burn? | What's In Your Fridge? ← Salt, the ancient food preserver. If you’re like me you are not in to spicy foods. Once that flavour hits your tongue that’s it; beads of sweat start to appear on your head and if you were a cartoon character smoke would be billowing out of your ears (good thing I am not a cartoon character). Ok so maybe that is just me but I’m sure most people will have a point in their life were they have what I dub “the fire tongue” (your mouth is screaming as it burns). For people who like that taste, good luck to you. For people more akin to my reaction, how do you rid yourself of that horrible feeling? The old wives tales would suggest milk, yoghurt or even alcohol but do any of them really work? First, what is considered a spicy food, well that depends on your taste buds but officially speaking it is any food that contains the chemical capsaicin. Capsaicin is an oil found in fruit from the Capsicum genus, which includes chilli peppers and paprika (crushed capsicum seeds). However, while bell peppers (commonly called capsicum) are part of this family most do not contain capsaicin. Capsaicin binds with receptors in the mouth and triggers the “burning” sensation that tells us the food is hot. So if you want to stop the “burn” you need to get rid of the capsaicin. So we eat capsaicin containing food and our mouth burns, to remove the burn we have to remove the fuel (capsaicin). Remember capsaicin is an oil, so there is no point reaching for an ice cold glass of water. We all know (or at least should) that oil and water doesn’t mix so dousing your mouth with water will do no good. How do we get rid of the oil then? Well you could rinse your mouth out with vegetable oil, which will bind to the capsaicin and remove it from your mouth. I’m not sure about you but this is not something that really appeals to me. Next, you could drink alcohol, another oil loving compound that will bind to the capsaicin and remove it from your mouth. However, beer does not have enough alcohol to actually help remove capsaicin. So unless you are keeping 70 proof alcohol around just in case its not really an option. The best solution… dairy. Yes, the old wives tale is true, a glass of cow juice will bind with the capsaicin and remove the burn. Milk (and other dairy products) contain casein, a protein that binds strongly with capsaicin oil, removing the problem from your mouth. Yoghurt and ice cream are considered better than milk. Youghurt and ice cream work better because of there thickness, they are much thicker than milk and will stay in the mouth longer. This means they can bind to more of the capsaicin and remove it faster. Rice, bread and other starchy food are also good at relieving the burn. While these don’t bind to the capsaicin it does remove the capsaicin from the mouth. The starchy food soaks up the capsaicin oil from the top of the tongue and causes the capsaicin to be swallowed along with the starchy food. So next time you need to douse the flames of a spicy meal reach for the starch or dairy and you’ll be good to go. Well now you do… capsaicin oil will also “burn” (irritate) the eyes and skin. If your sensitive to it like me it will also burn your nose when cooking with spices. Thanks I am glad you get as much enjoyment out of reading it as I do out of writing it.